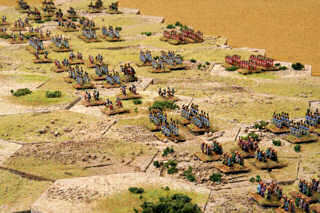 Welcome to all miniature enthusiasts and readers who visit here from theearlier article on6 mm Carthaginian Army.This article shows some 6 mm Baccus miniaturesto depict the Roman army for battling the Carthage duringthe Punic War, using Richard Borg's board gameCommands and Colors Ancients.Other good sites for information on this great game areJohn Foley's CCA site,Board Game Geek's CCA pages,and the Yahoo CCA Vassal group. The game is played on a hex board which are created here withGHQ Terrain Maker terrain hexes.The complete game board is 13 hexes wide by 9 hexes deep, so with these 4 inch (10 cm)hexes (measured flat side to opposite side), the complete board is 52 inches (130 cm) wideby 36 inches (90 cm) deep. The wide image at the top of the page shows a panorama of the Romanarmy at the Battle of Zama in 202 B.C.This is a famous battle of the Punic War in which the Roman general Scipiofinally defeated Carthaginian generals Hannibal and Hasdrubal and forced their culture into decline.The Carthaginian economy was destroyed, the field were salted, and arguablyNorth Africa has been reeling from this defeat ever since. 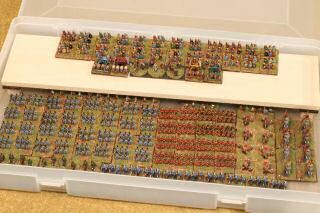 This photo shows the Roman left flank before the battle.Medium infantry have blue shields. Heavy infantry have red shields.Auxilia with bronze helmets and cavalry are on the flanks.Light skirmishers known as velites fill the gaps between the infantry.This formation is known as the triplex acies which is a checkered pattern in which the heavies and light skirmisher alternatedin order advance the troops but also to blunt any attacks fromcavalry or chariots. Here are 3 stands of Roman leaders, 3 figures per base.These are based on 20 mm circular bases to distinguish them from the regular army.Here I used some Vallejo textured acrylic medium (coarse pumice).This stuff is much better than textured spackle. You easily can mix acrylic paintand water to get the desired consistency andit goes on the base easily with spatula or old paint brush.Then you add some highlight color (e.g.Vallejo Desert Yellow) and some Woodland Scenicsstatic grass to give it that dry desert look.The figures are Baccus Roman Generals AIR6. 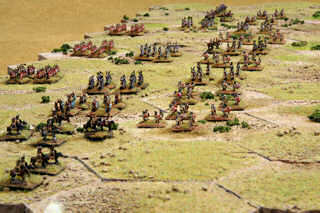 Here are 24 stands of Roman light infantry velites with their javelins and distinctive wolf skin headgear.There are 4 figures per 20 mm square steel base from Wargames Accessories.They sit atop a 40 mm square thin plywood from Litko Aerosystemswith some self adhesive flexible magnet.Since CCA has 4 infantry stands per unit, the magnetic base helpsmove 4 stands rather quickly. How do you pronounce velites :VEE-lights or vel-i-TAYS?From my reading, either is correct, and the style you use depends on whetheryou think new English words should have new English pronounciations (e.g. VEE-lights)or you think new English worlds should try to retain original pronounciations (e.g.vel-i-TAYS).Just as I prefer Tour-de-FRANTS over Tour-DAY-france, I prefer vel-i-TAYS.These figures are Baccus ARR3. Here are 8 stands of Roman eastern bowmen and 4 stands of slingers, 4 figures per base.In CCA slingers and bows can fire a long range of 3 hexes.There is no difference between slingers and bows in the game.These figures are Baccus Baleric slingers ASP3 and auxila archers AIR4. These figures are 8 stands of warriors, 6 figures per base.It is tough to see from the photo, but they are staggeredin a loose order.Most of them are without helmet and some have white lime colored hair.They have very snazzy Celtic painted shields.You cannot see it in the photos, but the infantry havepainted green circles, blue triangles, and red squares tohelp identify them.They are also distinguished by the number of figures per base.These figures are Baccus ASP2. Here comes the might of ancient Rome.Here are 32 stands of medium infantry with nice matching blue oval shields.These figures represent the Hastati and Princeps of the Republican Roman army.These warriors have a bronze helmet with a black feather plume.The density is starting to look formidable.These guys are packed 6 to a base.The figures are Baccus ARR1. These are 16 stands of heavy infantry packed 8 to a base.They completely fill the 20 mm base edge to edge.These are Roman third line infantry also known as triarii.Most battles these veterans hung in the back line and avoided combat unless things went wrong.Imagine being a fierce warrior and trying to breech this tight formation! If you look closely you will see the mistake that every miniature painter hates to make.The figures are painted, you have sleepy eyes and weary mind from painting all day.You apply that last step of protective varnish and to your tired eyesyou see that you are not spraying varnish, YOU ARE SPRAYING BLACK PRIMER!Oh well, I touched them up as best as possible, and it is tough to see with 6 mm figures.These figures are Baccus ARR6. 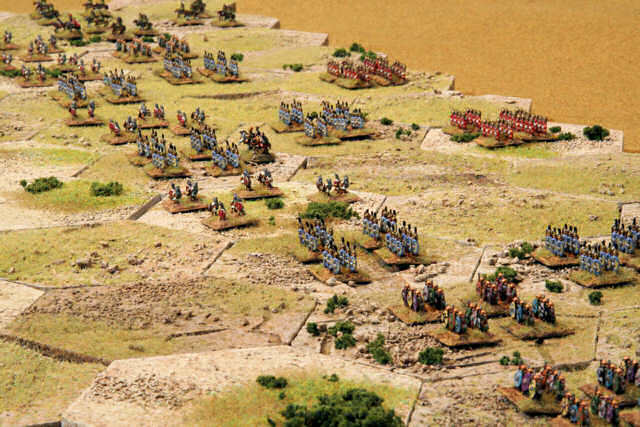 These are 12 stands of light cavalry, 2 figures per base.Like the infantry, they are each on 20 mm square bases,but in CCA there are 3 stands per unit, so these standsare magnetically attached to a 60 by 20 mm rectangular base.These figures are Baccus Roman light cav ARR5. Here are 18 stands of medium cavalry, 3 figures per base.These Roman auxilia cavalryare gathered from provinces far and widevowing to destroy the Carthaginians.These figures are Baccus AIR3. Here are 8 stands of Roman artillery, 2 warriors and a ballista per base.The ballista is a torsion rope-powered bolt thrower that is highly accuratebut not very mobile or very high rate-of-fire.The figures are Baccus AIR5. Here are 2 stands of chariots, 2 chariots per stand.Although few CCA scenarios have Roman chariots,these guys are certainly reusable as Persian or Greek units.In fact, these figures are Baccus "Persian Chariots" APE15.I painted them as brightly and awe-inspiring as possible. Ialso put 2 to a base to make them seem a little more formidablefor the games. Finally, you either must be very bored, at work, or you really wantto see the Roman elephants!Here are 4 bases of elephants, 2 pachyderms per base.The Baccus Macedonian elephants don't look very indomitable,so I added a big pike to the riders, made with a piece ofbrass wire sharpened to a nice point.This is good for sweeping away pesky skirmishers and rancid cavalry. Although not many CCA scenarios use Roman elephants,you certainly want to have more elephants for design-your-ownscenarios, and for making the elephants very imposing.Elephants are very enjoyable and random in CCA.Eighty percent of the time, they do some random damageand then give a banner to your enemy as they are destroyed.However, 10 percent of the time they are deadly to you enemy,and the other 10 percent of the time, they are deadly to you!So here are a total of 12 figures from Baccus AMA8. Here's a view of the army, nicely stowed away in a 13.75 by 8.5 inch (35 by 22 cm) tackle box.The stands do not all sit on the base of the box, so I constructed a secondlevel from bass wood and some wooden blocks for feet.Sheesh, here you are looking at nearly 3 months of hobby time.I hope I don't drop it or smash it on the ground while skydiving. Thanks for visiting and reading about my Commands and Colors Ancients figures.The next step will be to investigate theGreeks and Persians for the expansion set.Thank you Baccus for making such a great range of ancient 6 mm figures.If you have a similar set of CCA figures, I would be interested in seeingyour version and the ideas you used to make the game.More miniatures-related articles are atDan Becker's Miniatures and Models siteor go directly to my6 mm Carthaginian Army,the GHQ terrain preview,or theBattle of Zama photos. Last modified: Thursday, 09-Jun-2011 12:55:34 MST.